The part of the book which is visible as it stands closed on the shelf. ​The base for the sides of any bound (or hard back) book. Smooth, with no perceptible grain. Natural colour is pale biscuit. ​It can be dyed to almost any shade. Grained, hard-wearing leather made of goatskin. Appropriate for dying in strong colours. Skin of a calf, not tanned but de-greased and specially treated. Smooth and usually pale in colour. ​Spine and boards covered in leather (or vellum). ​Spine and outer corners are of leather (or vellum) while the sides are covered with cloth or paper. ​Only the spine is of leather and sides are covered with cloth or paper. 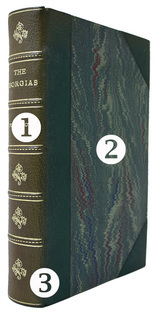 The original binding in which the first edition is published. This can be a publisher's binding or a re-bind within the 10 years of publication ie the binding is of its period. This is accepted as 'contemporary'. Often the Victorians would initially publish books in cloth. Then some people would have these bound in a leather binding or prize binding put on instead of cloth. These can even become more valuable than the original first edition. This would be a binding of the period – say, up to 50 years after original publication. A binding that dates back no further than the last decade. Often done when the text is originally bound in cloth/ paper; rebound in leather to make a more attractive and durable edition. It will usually be done in the style of the period. The Spine: This often suffers fading from exposure to light over time; title labels can be chipped/ flaking off; the leather can show signs of wear, scratches or rubbing; the spine itself can come loose from the book. The Hinges: These can wear thin/ become cracked causing the boards to separate from the spine. ​The Boards: These can, like the spine, suffer from scuffing and show signs of wear. If half or quarter bound the paper/ cloth can be easily damaged. Octavo [8vo. ]: The most common size of book since the early 17th Century. Each sheet of paper is folded three times. Quarto [4to]: Normally lies in between folio and octavo in size. Squarish in shape. Each sheet has been folded twice. Whole sheet illustration, printed separately from the text. All copies of a book printed at any time/ times from one setting-up of type without substantial change (i.e. There is no variation in the text or publisher). There may be some tiny corrections if any spelling mistakes have been picked up. So the publisher could make a first print run of 5,000 and sell out within a couple of months. They would then reprint from the same set-up. This re-print would be the second impression of the first edition. Very roughly speaking, this means the first appearance of the work in question, independently, between its own original cover. It is possible to get a first edition that is published years after the first time a book is published - this could be when a new publisher takes on a book, perhaps with a new illustrator - this could even be more valuable than the original. Generally speaking first editions are regarded as the as most valuable HOWEVER sometimes a second or third edition can be more valuable - it could be a limited printed run etc.